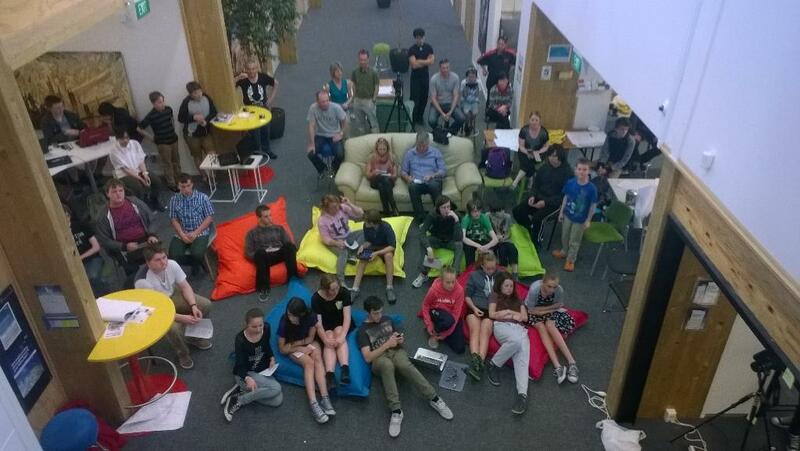 On the 8th of November I was an industry mentor at CodeClub Mashup 2014 which was held at Epic Innovation in Christchurch. The event was sponsored by Environment Canterbury (ECAN), Land Information New Zealand (LINZ) and Code Club Aotearoa. Mashup 2014 was a “concept to cash” in one day competition for local high schools. We had roughly 40 students turn up and we started the day with introductions to hardware/software based product development and basic business skills. A team from a Selwyn House an Independent School for Girls from year 1 – 8 explained in a blog post what is mashup. This entry was posted in CodeClub, Education, Internet of Things, Mashup, Mashup 2014, Sensors and tagged CodeClub, education, Environment Canterbury, Epic Innovation, Internet Of Things, Land Information New Zealand, Mashup, Mashup 2014. Bookmark the permalink.